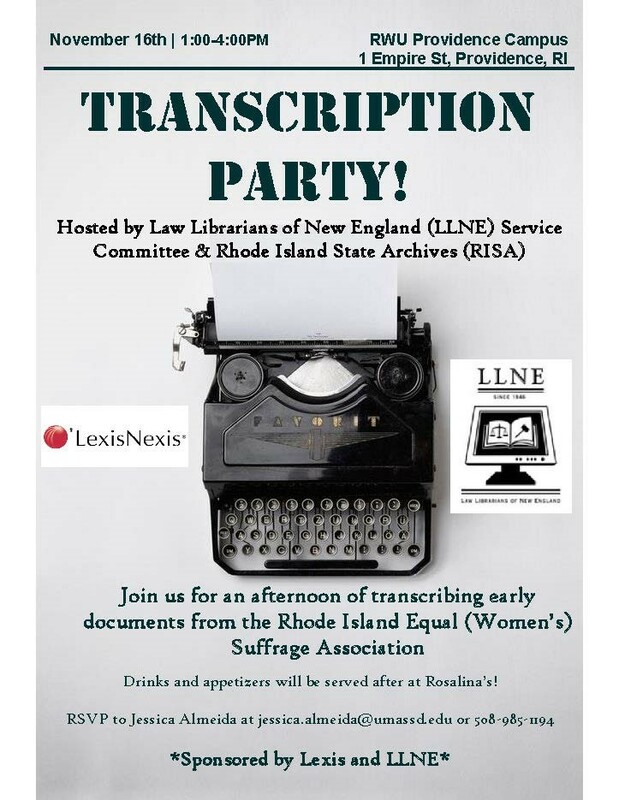 Email Jessica at jessica.almeida@umassd.edu to receive 5 pages from the Rhode Island State Archives Suffrage Association collection. (Want more or less? Just let us know!). Check out the following helpful transcription guides: Transcription Tips and Reading Historical Handwriting. 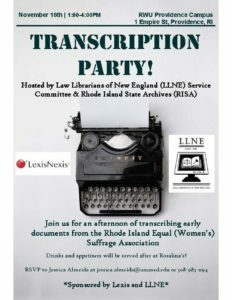 Get transcribing! Transcribe your pages by typing each word into a Microsoft Word document. If you have any questions at anytime during the process, just email a member of the Service Committee! There are some questions that a public librarian will not answer because they fall under the purview of a specialized profession. We don’t want to do harm to our patrons nor do we want to be liable for questions about health, medicine, or taxes. You can also add legal questions to this list, but what I learned at LRIP is that there is a world of difference between legal advice and questions about the law. Information about the law is much more readily available than I realized. It was useful and instructive to learn how to use Lexis and Westlaw, but most public libraries do not have the funding for such resources. But LRIP taught me how to find useful legal information via Google as well as state and federal government websites. The lessons learned in this course certainly made me feel empowered. Before LRIP, I would refer all legal questions down the road to the Plymouth Law Library. After LRIP, I feel better prepared to help patrons with questions about the law. *Alvin Ealy is the Head of Adult Services/Reference at the Kingston Public Library in Kingston, MA and a recipient of the 2018 LLNE Service Committee Scholarship to attend the Legal Research Information Program. For this year’s Spring service project, the Service Committee organized a drive for Veterans Inc. Helping homeless veterans since 1990, Veterans Inc. provides housing, medical, and employment assistance to veterans in the New England area. Based in Worcester, Massachusetts, their philosophy is “They were there when we needed them. We must be there now that they need us.” Veterans Inc. provides 24/7 support to veterans and their families with emergency, transitional, and long-term housing, career counseling and training, as well as support groups and substance abuse treatment programs. For more information on Veterans Inc., visit http://www.veteransinc.org/. 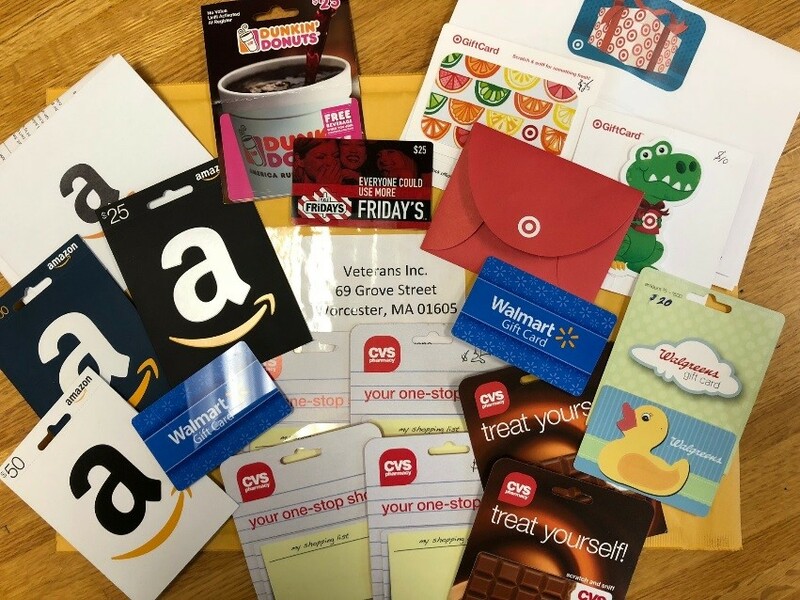 To help them supply essentials to veterans in need, the Service Committee asked LLNE members to donate gift cards that provide food, clothes, and medicine. The committee is pleased to report that $555 in gift cards was contributed by LLNE members. Thank you to everyone for their generous donations. Thank you to the members of the LLNE Service Committee for organizing the Veterans Inc. Drive. The Service Committee is always looking for more volunteers! If interested, go to https://llne.org/committees/service/. Beyond supporting patrons’ research and learning interests, I would like to extend the reach of what we can do at the library in terms of patrons’ access to justice. Perhaps because of our proximity to the Trial Court Library, reference services have comprised of referring folks to the expertise of the law librarians there. I felt limited by my own threadbare understanding of the legal system and intimidated by the process of reading the law. In these regards, I certainly related to patrons dealing with complex, unfamiliar, or overwhelming legal issues. The Legal Research Instruction Program exposed me not only to open-web legal resources that I can share, both with patrons and on our library’s website, but also to the types of research methodologies that attorneys, paralegals, and law librarians use. This type of insight strengthens my own research process, which helps me to interview patrons better and prepare them for further research at the Trial Court Library. Furthermore, I’m excited to connect to the law librarians there, build a stronger professional relationship between our two institutions, and better facilitate community access to legal information. Considering the systemic inequalities that play out through the courts, the laws, and law enforcement, I consider this work to be profoundly important for our commitment to equity and justice. It was a great, eye-opening experience to demystify the legal research process! 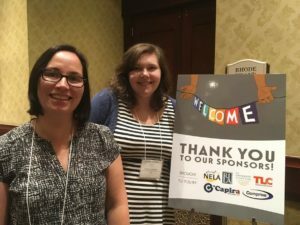 *Heather Diaz is a reference librarian at Forbes Library in Northampton and a recipient of the 2018 LLNE Service Committee Scholarship to attend the Legal Research Information Program. Posted on May 17, 2018 Author Anna Lawless-CollinsCategories Committee News, Service, Spring MeetingLeave a comment on Spring Service Committee Project: Veterans Inc.
Nutter McClennen & Fish LLP. Spring meeting registration now open! Posted on May 3, 2018 Author Anna Lawless-CollinsCategories ABLL, Committee News, Education, Spring MeetingLeave a comment on Spring meeting registration now open!